You are here: Home / News / Is LeBron James good or bad for the Lakers. Is LeBron James good or bad for the Lakers. 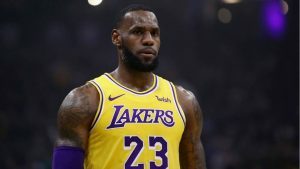 (ThyBlackMan.com) LeBron James and the Los Angeles Lakers union on paper is a perfect match. The biggest athlete on the planet is matched up with the biggest market on the planet. Together, the two operations are slated to be a major box office draw, and bring intrigue to a franchise that hasn’t been to the playoffs since the Kobe Bryant-led Lakers in 2013. So far, the union has gone as expected. The Lakers aren’t considered world beaters, but they are good enough to be considered sneaky-a team not to look over. James has led the Lakers to a 14-9 spot-good for 5th in a competitive Western Conference. James is having a Lebronesque year, averaging 27.8 points, 7.8 rebounds and 6.7 assists on 52 percent shooting. Lakers Head Coach Luke Walton main goals for this season was to balance James and his minutes, experiment with his overall workload and try to ween James off the ball as much as possible. But that’s where the dilemma starts: James needs the ball in order for the Lakers to be as successful as possible. Which gives us the next dilemma: James has a young roster in tow. The Lakers have operated off of a youth movement, drafting young, talented players such as Brandon Ingram, Kyle Kuzma and Lonzo Ball. The three were selected to be the core of the team, but then James signed in July, and obviously everything has changed. With that being said, can James and his playing style sustain itself with the Lakers? In a way, yes it can. But it will depend on whether Walton’s coaching acumen can hold up, and can a young Lakers squad can handle James and his high expectations. When James won his first two NBA titles in 2012 and 2013, he was under the leadership of Pat Riley as the Miami Heat president. There, James learned the true power of leadership on the floor, and what it takes to win. He also learned to trust his head coach Erik Spolstra, and respect that he was the coach and James just the player. With the Lakers, James is in a similar situation, as Magic Johnson is the team’s president and James is learning to trust the acumen of Walton. Where the Lakers and the Heat situation differ, is that James walked into Miami in which the team’s core players, outside of JaVale McGee and Rajon Rondo, sustained some sort of success in the postseason. James played with Chris Bosh and Dwyane Wade, in which both players had led their teams to the NBA Playoffs, while of course Wade won a title before the arrival of James. James has to break down Hart, Ball and Ingram to get them to sacrifice for the team. And the way to sacrifice, is to let James lead them-even when they want to. So when you evaluate whether or not James is a good fit for the Lakers, it truly depends on the perspective you take. If you believe that the Lakers don’t need such brute force to win, in which the option of letting the players develop on their own time without James and his prima-donna ways best suits the team, then that’s one thing. If you believe that the leadership of James may make the players uncomfortable, but also believe that the players will benefit from the three-time champion leading the charge, then that’s another. But one thing is clear: LeBron James will not tolerate any half-stepping. Ingram, Hart and Ball have grown accustomed to being the leaders of their teams growing up, and it probably was enough for the three of them to figure it out on their own. With James, it isn’t about figuring it out, it’s about when. And the time for that is not on their side. What is, though, is championship expertise. And whether they listen or not, will entirely be up to them. Also connect with this brother through Twitter; http://twitter.com/theGURO15.